It sounds like an idea from a bad science fiction movie: mushrooms that produce current. But it is most certainly true (although not yet on a practical scale): researchers in the United States have shown that it is possible to produce current by covering mushrooms with bacteria. The researchers, associated with the Stevens Institute of Technology and under the direction of Sudeep Joshi, came upon this idea, appropriately enough during a lunch. In the search for alternative and mainly renewable energy sources, the so-called cyanobacteria have already attracted attention for some time. The organisms, which occur on land and in the oceans in large numbers, are able to convert sunlight into electricity. A significant problem is that these bacteria don't live long enough on artificial surfaces to be of practical use. 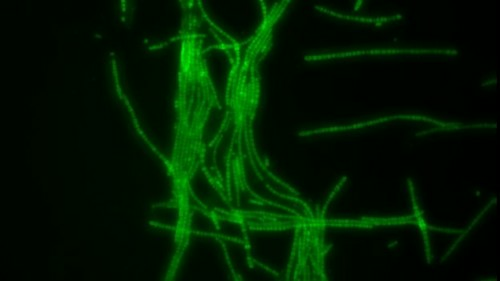 During lunch, which also had mushrooms on the menu, the researchers came upon the idea of using this prolific fungus, which already provides a breeding ground for countless other forms of bacterial life, as a breeding ground for cyanobacteria. 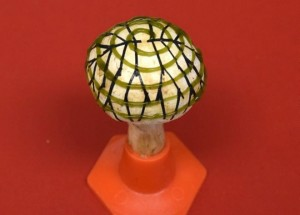 With the aid of a special bio-ink, the researchers printed the bacteria in a spiral on the ‘hat’ of the mushroom, onto which earlier, using electronic ink, nano wires of graphene were printed to collect the current. When this magic mushroom was subsequently illuminated, the bacteria did indeed supply a small amount of electricity.